MAB 825 and MAB 845 | Advance Drills Inc.
Model MAB 825 shown. For swivel base providing 30° movement left and right and 3/4″ forward and backward, order model MAB 845. Drill up to 4″ dia. & Tap up to 1-1/8″ dia. 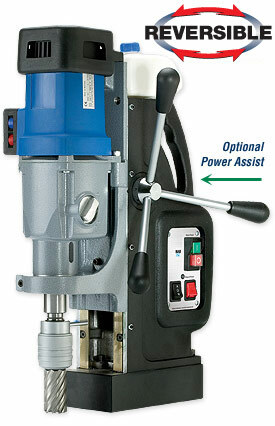 Twist drilling and reaming up to 1-1/4″ dia. Twist Drill Capacity 1-1/4″ dia. Magnetic Force (1″ plate) 6600 lbs. Standard Equipment also includes operating manual, auto lubrication, safety strap, carabin hook, gloves, safety glasses, ear protection and allen keys.